Virginia Capitol Police Officer Kenneth J. "Joe" Pugh is now in his fourth gubernatorial administration, most of that at the Mansion Gate post. 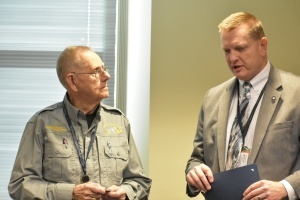 Joe Vass, the inventory and supply officer for the Virginia Capitol Police, celebrated his 90th birthday in January 2018 with a recognition certificate from Col. Anthony S. Pike, the division's chief. 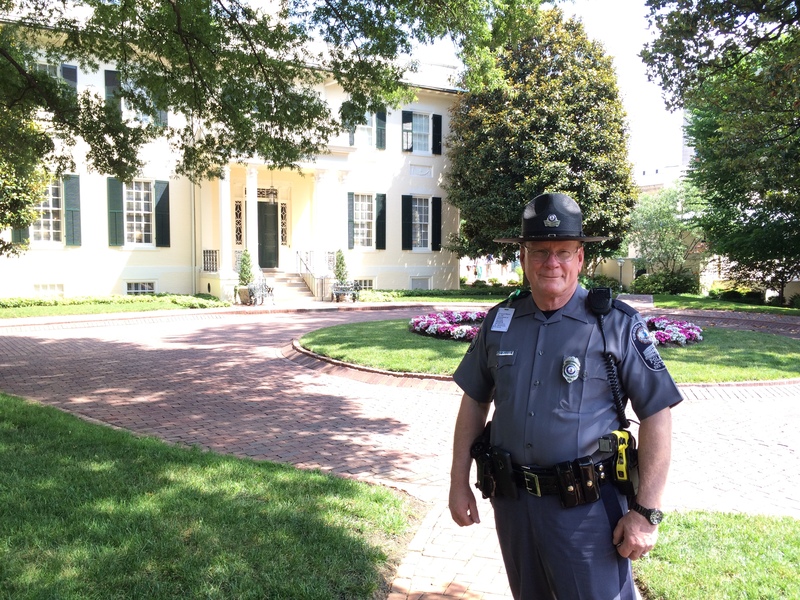 When you become a member of the Virginia Capitol Police, your job site is anything but typical. All Virginia Capitol Police recruits undergo extensive training in a variety of state-mandated subjects, including defensive tactics. 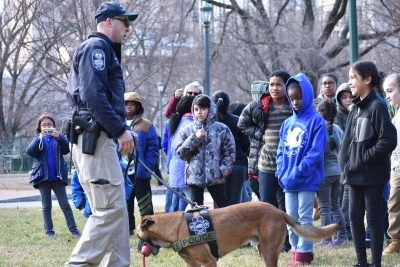 Officer Sean Chaulklin and Gunner, one of the Virginia Capitol Police K-9s, met with a group of students from Chesterfield County's A.M. Davis Elementary School. With the Virginia Capitol Police honor guard in the background, Elliott Yamin sings the National Anthem before the Toyota Owners 400 at Richmond Raceway in April 2018. 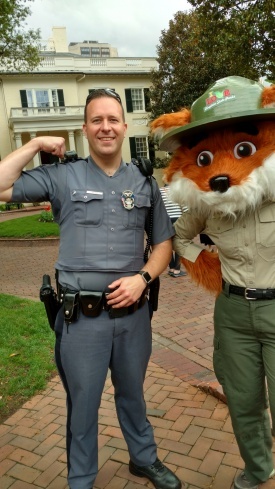 Ranger Parker Redfox, the mascot of the Virginia State Parks System, decided to challenge Sgt. Mike Flick to a "gun show." Ranger fail. 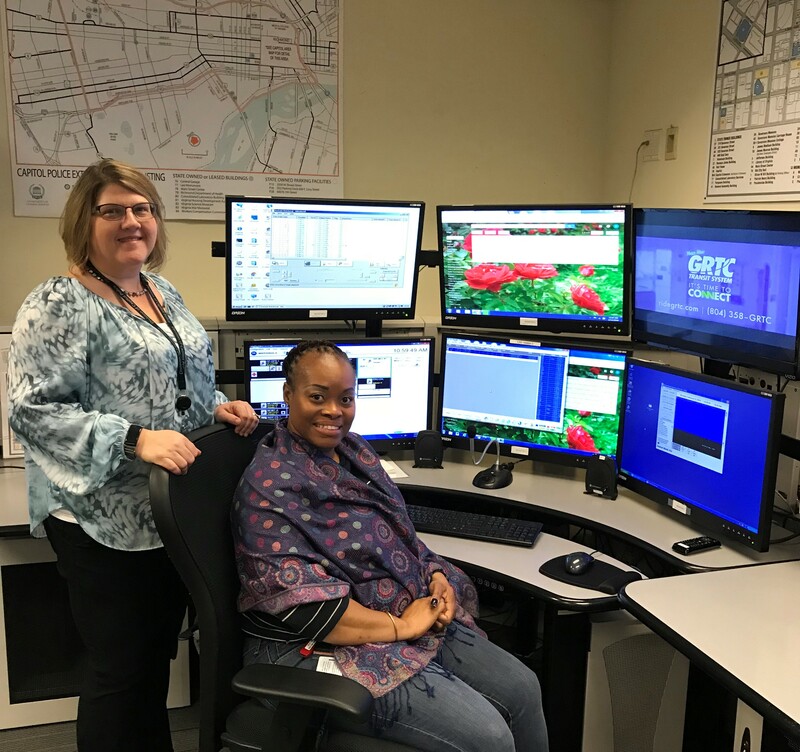 Karen Anderson and Kawina Simon staffing the division's Communications Center. 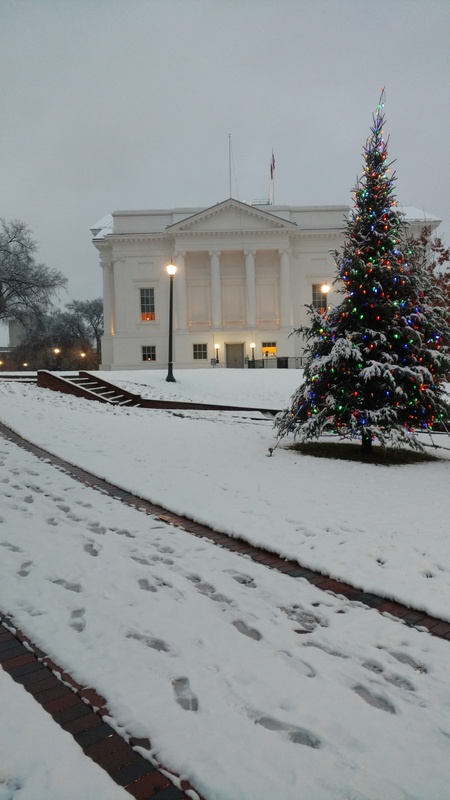 If you go to work for the Virginia Capitol Police, you'll learn how to throw a party. A really big party. At a center aisle presentation in the House of Delegates on Feb. 9, 2018, Col. Anthony S. Pike acknowledged a standing ovation from the members in recognition of the agency's 400th anniversary. There is an unquestionable feeling of accomplishment when you've finished 26 weeks of basic training at the Crater Criminal Justice Training Academy and you're ready to join the Virginia Capitol Police. Tyrannosaurus Rex showed up at the Capitol Square bell tower for an environmental protest on March 19, 2018, but Sgt. Mike Flick kept an eye on the beast to make sure he behaved himself. Rex got the message. 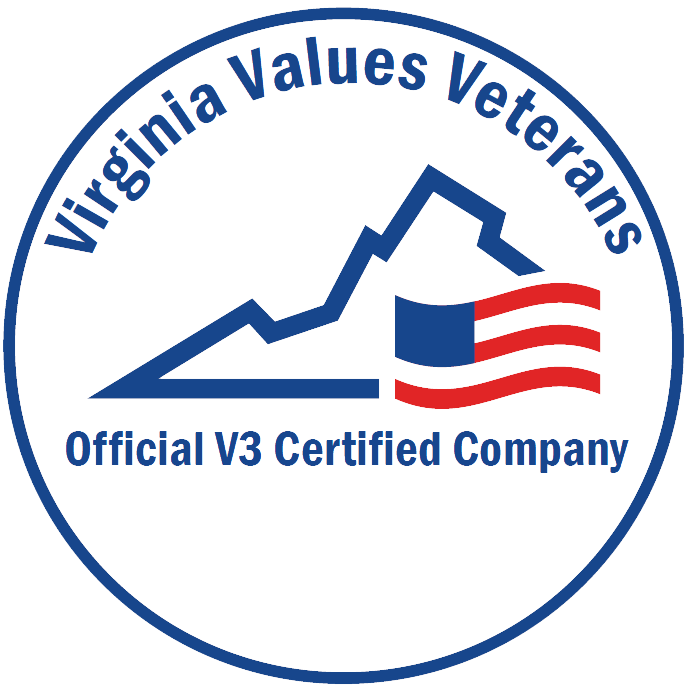 As part of the division's reaccreditation with the Virginia Law Enforcement Professional Standards Commission, members of the Virginia Capitol Police met in March 2018 with an assessment team from the commission. The division's Officer Zachary Jacobs made a brief presentation on the division's bicycle unit. Our resident CrossFit guru, Sgt. Anthony "Tony" Gulotta, came in 236th out of 8,355 athletes in the 2018 CrossFit Worldwide competition's masters' division (age 50-54). Among law enforcement masters' athletes, he was eighth out of 300 worldwide and No. 1 out of 30 in the mid-Atlantic. Virginia Capitol Police officers get some interesting vantage points at work, especially when they're on bicycle patrol. Special Agent James L. Cosby logged 125.3 miles in the "Bike for the Blue" on May 13 and another 124 miles home from Washington, D.C., on May 14. And yes, he was in work May 15 by 8:30 a.m.
Dorothy P. Seawell, widow of William A. Seawell, the Capitol Police chief from 1961-70, was on hand on Aug. 27 for the opening of an exhibit in the Virginia Capitol Annex celebrating the division's 400-year history. First Lady Pamela Northam presented Col. Anthony S. Pike a proclamation noting Virginia Capitol Police Day on Nov. 18, 2018, the date of the agency's 400th anniversary. Jim Hopper of the Department of Defense and Col. Anthony S. Pike, chief of the Capitol Police, presented Sgt. Chanda N. Cross a Patriotic Employer Award on Feb. 1, 2019. Cross was honored for helping prepare Reginald X. Cheeseboro, a fellow Capitol Police officer, for his current overseas military deployment.